Discussing finances might not be as romantic as honeymoon talk—but it's certainly important. Here's how to start the process of combining your finances after marriage. Ahh, marriage. The merging of two hearts, two souls, two lives, two… bank accounts. Sure, the conversation about combining finances after marriage isn’t as romantic as honeymoon talk, but it’s way more important, and rightfully deserves a top spot on your wedding planning checklist. And sure, you can spurn the convo and wing it, keeping your finances separate and continue doing your own thing, but as your relationship evolves and becomes more and more mature, it’ll be come harder and harder to keep money things separate. 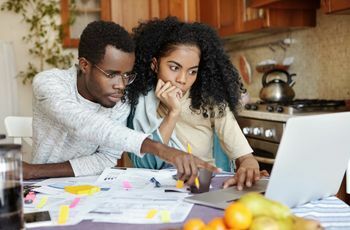 The more comfortable you are talking about something as personal as money with your partner, the easier it’ll be to make important decisions about combining finances after marriage when the time comes. So become an open book about your finances, and encourage him or her to do the same! Outside of our life partners and maybe our parents, we’re not used to being candid about things like our salaries and how we spend our cash. For most of us, it’s a learning curve—but it gets more comfortable over time, trust me. Once you’re engaged (or even before if you’re into that! ), put all cards on the table: Start a spreadsheet, input each of your incomes, personal expenses, savings, goals, whatever. Keep it updated. Even if you’re not yet ready to open an account together or go in on a credit card, just knowing the numbers is a great start! Are you ready to combine your finances? Or do you think you’ll stay separate even after the wedding? Whatever you want to do, decide together! 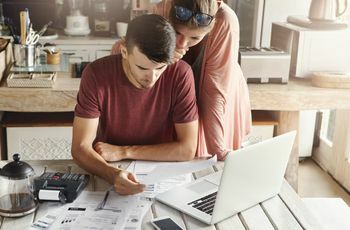 You can go all in—combining finances after marriage and dumping all of both of your finances into shared accounts that you both have all-access to—stay completely separate and split things as needed—or find a solution somewhere in the middle. Talk about your goals together and pick a plan that’ll help you get there. Here’s what my husband and I do: We each have our own checking accounts and credit cards, but we also set up a joint checking account from which we pay bills, buy groceries, pay for trips, save a little, and all that fun stuff. Each pay period, the two of us deposit a dollar amount proportional to our incomes into this shared account, then keep the rest of our paychecks to ourselves. It works for us, for now. And it makes it so I can shop without spending his money, we can still treat one another to dinner now and then with our “own” money. It took a little math and planning to get here, but it couldn’t be smoother! Moral of the story: This decision shouldn’t be made lightly, and not in a vacuum, either. Best part: You guys can always change your mind! As soon as you’ve decided what to do, don’t slack in making it happen. The longer you linger, the longer you two delay reaching your financial goals together—whether they be taking a fabulous vacay, buying a new dishwasher, or saving up for a down payment. If you’re starting a joint account, head into your local branch and work with a banker in person—a key part of “adulting” is getting to know your banker personally and reaping the benefits of that relationship down the line! For example, they might be able to offer you a great rate on a loan someday, or point you to the best credit card for your needs. 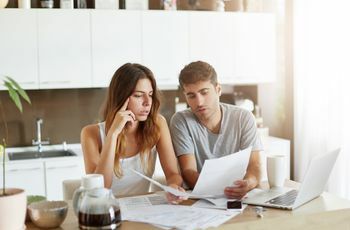 The plan you make for combining your finances after marriage in your 20s probably won’t still fit when you’re in your early 40s with kids and a mortgage (just an example!). 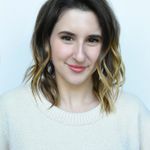 Your plan should be scalable as your lives shift—salaries grow (and sometimes shrink), people go back to school, babies are born, major purchases are made, major debts are paid—all of these events can tweak your individual contributions to a shared account, your savings targets, and so on. And marriage is, above all else, about partnership and support—not about constantly keeping it 50/50. So, you should make your plan flexible and expect to see the proportion of what each of you contribute to change over time. Of course, the very best way to be ready for any of these changes is to have savings—and the very best way to have savings is to contribute a little more to your shared accounts than you need to, every time you contribute. Every little bit counts! Exciting stuff? 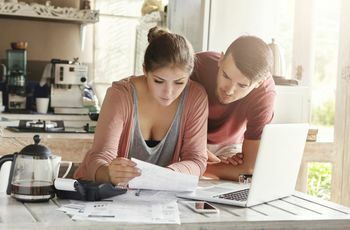 Combining finances after marriage with your one true love and taking the first steps toward realizing your future together. Less exciting stuff? Thinking about taxes. But you still have to do it! After you’ve set up your accounts and made your plan, meet with a real financial planner (e.g., not this particular wedding blogger, lol) to talk you through all the important nuts and bolts like whether or not you two should file taxes together (some people should, some, like those on certain student loan repayment plans, fare better by continuing to file separately), establishing one another as beneficiaries on certain policies and estates, and more. Oh, and if either of you are changing your name, be sure to do all of this after the fact, or you’ll have to do it all over again with your new name. I can’t imagine what it was like being married and dealing with money before the Internet, but luckily, none of us have to. 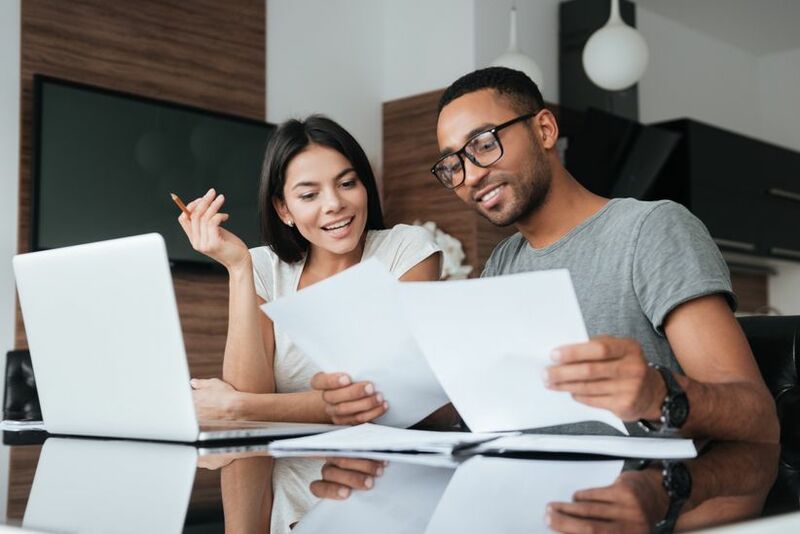 As you and your spouse make deposits and withdrawals from your shared accounts, keep things as transparent as possible—even if it feels a little bit unnecessary at times. My husband and I always shoot one another a text if we’re using the shared card for something outside of the ordinary, or if we’re making extra deposits for whatever reason. It’s not because we’re policing one another, but because managing shared finances is a shared job, and two heads are better than one! This goes without saying, but, no one should ever make major (or even minor, really) purchases using a shared account without an all-in discussion first! (Plus, if your relationship is anything like mine, there’s a good chance one of you is a little more financially conservative than the other, so the checks-and-balances system will work in everyone’s favor.) If you’re both the running-around-like-crazy types who barely have a moment to text one another during the day, simply schedule a monthly chat to go over all the activity on your shared account together. See? Money isn’t that hard after all!